2. The practice of maintaining a nonjudgmental state of heightened or complete awareness of one’s thoughts, emotions, or experiences on a moment-to-moment basis. 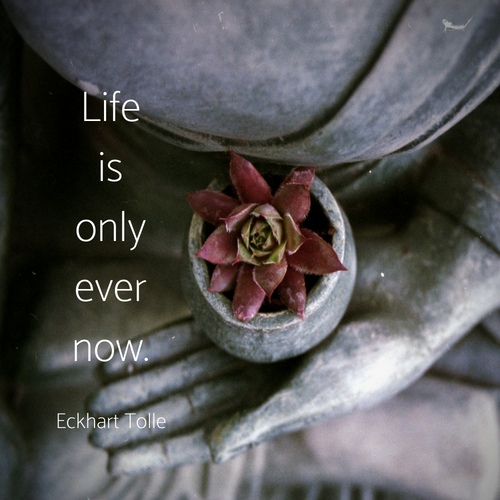 Being present, living in the moment, the power of now…there are many different ways of describing mindfulness. Recently, in order to survive an exceptionally busy week I found myself using a mindfulness technique my meditation teacher taught me. To call my mind back from the wreckage of my future I focused on what it was that I was doing right then then repeated it to myself as I did it. I’m brushing my teeth…I’m driving in my car…I’m dialing the phone…I’m walking up the stairs…you get the idea. Becoming aware of the present moment had a calming and focusing effect, reducing my anxiety and ultimately helping me use my time more wisely and purposefully. Pro tip: this technique works if you find yourself stuck rehashing the past too. I thought that fretting about and trying to plan (aka control) the future would give me more peace of mind. The truth is that I wasted a lot of precious time doing that, and it sure didn’t net me the peace of mind I was seeking. That’s exactly what Eckhart Tolle is talking about when he says people believe that the next moment must be more important than the current one. 12-step programs advise members to take things “one day at a time” which is another way to stay present. Sometimes a day feels like too much, and it needs to be one minute at a time or even one breath. The effect is the same as my mindfulness trick – awareness returns to the present moment, and it becomes clear that in that moment we are ok. When our minds calm down and panic subsides we can better assess what to do in each subsequent moment. The only place where action can be taken is right now, the present moment. That’s what the “power of now” is all about. Do you have your own mindfulness practice to share? If you don’t maybe this will inspire you to start one. Either way, report back! I’d love to hear about your experience. And in less than 10 minutes Andy Puddicombe explains how 10 minutes of mindfulness can change your life. Women's Independence Scholarship Program, Inc.
© Copyright 2017 Womens Independence Scholarship Program, Inc.